Well everybody its now official, invites have been handed out by Apple (where’s ours eh) for the a launch even on the 7th March. Quite what’s going to be announced is anyone’s guess and I’m sure you’ve all seen the news and speculation on what it could be. Apple confirmed the event at the Yerba Buena Centre for the Arts in San Francisco at 10am PST (6pm GMT) on Wednesday, March 7. A UK press event will also take place in London’s Kings Cross. Some might argue that the timing is a little odd what with the G23 5HS and the upcoming keynote address from google. What will the event hold. 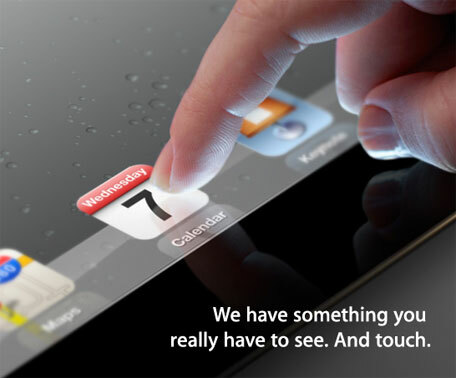 Odds are on that it’s going to be the iPad 3 or the iPad 2s with a retina screen. Other outside changes are Siri integration on to other models, content updates for Apple TV but who really knows apart from Apple. Previous Previous post: mumu Slide Case For iPhone 4 and 4s World Exclusive First Look.